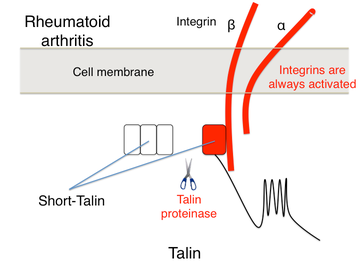 We recently discovered that talin was cleaved into short form (short talin) in peripheral blood from rheumatoid arthritis (RA) patients. This short-talin binds to the integrin domain more tightly and activates integrin followed by the integrin activation, T cell migration, synoviocyte activation, cytokine production, and bone destruction. The new therapeutic procedures have been developed based on the research that the regulation of this short talin is the key for the treatment of RA. Normally, talin rod domain blocks the binding of the talin head domain to the β-integrin cytoplasmic domain. 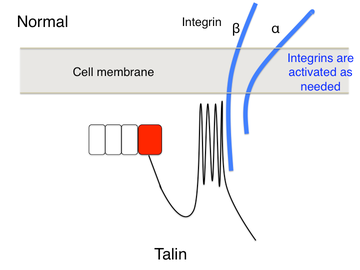 Once the rod domain is cleaved by calpain, talin head domain binds to the integrin followed by the integrin activation. We discovered that talin head domain is cleaved into short forms (short-talin) by a proteinase (tentative name: talin proteinase) in RA patinets. This short-talin binds directly to the β-integrin cytoplasmic domain followed by the constant activation of integrin. We have developed the talin protease inhibitor that was confirmed to inhibit the binding of talin proteinase to talin head domain. 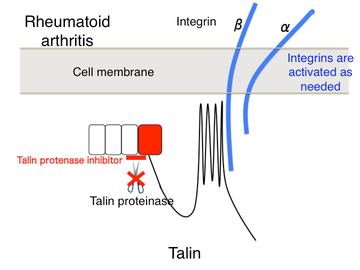 This talin proteinase inhibitor can suppress the constant integrin activation of the short-talin followed by the inhibition of the bone destruction of RA.